Todays post is to share the recreation of a card I made back in September 2016 (Click here to view my original). 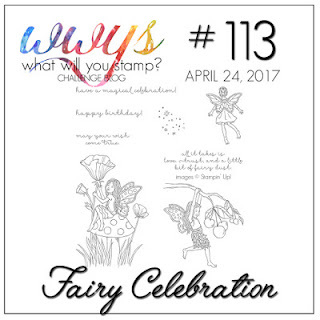 I was inspired to pull out and ink up the super cute Fairy Celebration stamp set again, by this weeks What Will You Stamp? Challenge #113, and recreate my card in a different colour to see how it would change the feel. My original used Wisteria Wonder. 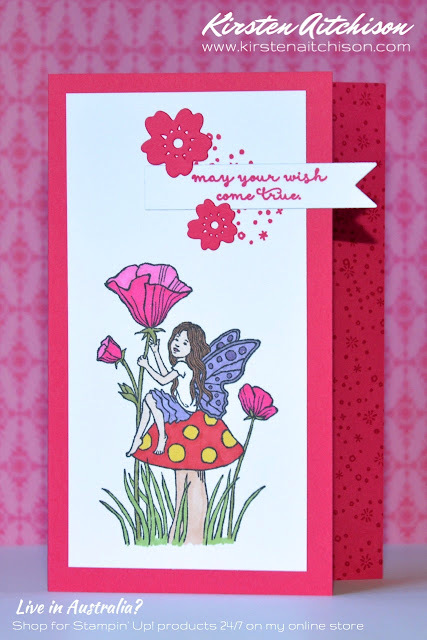 I used alcohol markers (retired Blendabilities) to colour my fairies, but I may need to make another card to try out my new Watercolour pencils. 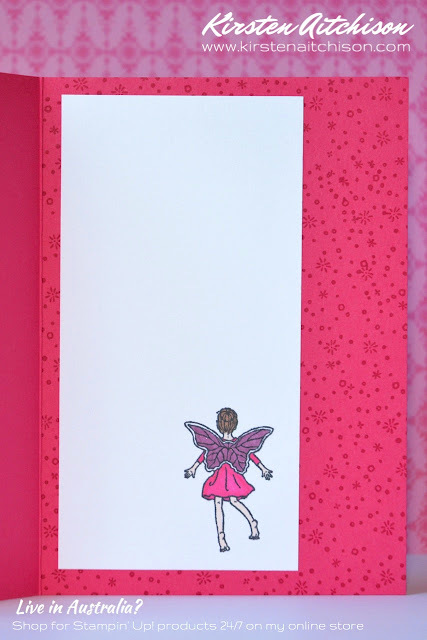 I sparkled up the flowers and fairy wings on the front and the wings of the fairy inside, using clear Wink of Stella. This is a little hard to photograph (but can be seen in the top photo), and provides a nice subtle sparkle to the card. If you would like more details on how I made this card, please check out the post of my original card. I went to look at your first fairy. I love them both! I was just wondering at you card stock measurements? 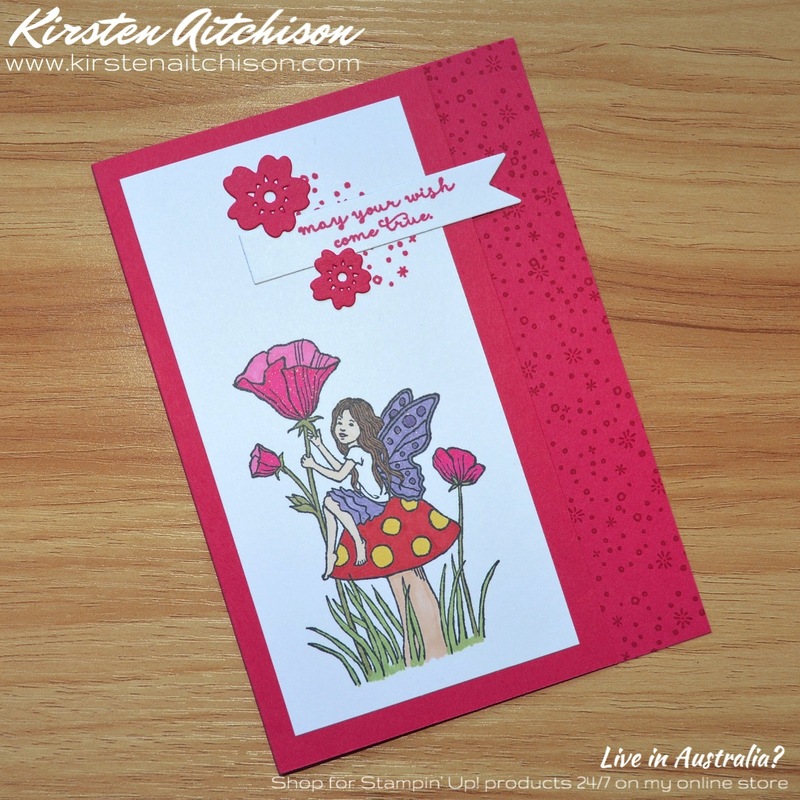 Thanks so much Gloria :) I have used an A5 sheet of card stock scored half way at 10.5cm and then trimmed about 2.5cm off the front section so it is about 8cm wide, while the back is 10.5cm wide.